U.S. 60 runs from the middle of the Arizona desert off Interstate 10 east of Quartzsite to U.S. 58 in Virginia Beach, Virginia, on the shores of the Atlantic Ocean. It travels through Arizona, New Mexico, Texas, Oklahoma, Missouri, Kentucky, West Virginia, and Virginia. U.S. 60 enters the state of Oklahoma from the northern Texas panhandle. It immediately becomes duplexed with OK 51 upon entry into the Sooner State, and they remain duplexed for over 60 miles. After splitting south of Seiling, U.S. 60 then heads north and joins U.S. 270, U.S. 281, and OK 3. In Seiling, U.S. 60 and U.S. 281 depart to the north duplexed while U.S. 281 and OK 3 continue northwest. Four and a half miles later, U.S. 60 heads east on its own for the first time in Oklahoma. North of the town of Fairview, U.S. 60 becomes duplexed with U.S. 412. The two U.S. highways are joined for almost 34 miles until they split in Enid. U.S. 60 heads north with U.S. 81 in Enid, which is the county seat of Garfield County. After heading north for 15 miles, with U.S. 81 (and U.S. 64, which joins the two highways in North Enid), U.S. 60 and U.S. 81 head east for four more miles before U.S. 60 becomes single once again. A short duplex near Lamont with OK 74 is all that lies between U.S. 81 and Interstate 35. At the interstate, U.S. 60 becomes a 4-lane divided highway with a 70 mph speed limit and interchanges at major intersections for 12 miles between Interstate 35 and Business U.S. 60 in Ponca City. U.S. 77 and U.S. 177 join U.S. 60 for 12 miles, where the combinations of U.S. 60 East/U.S. 77 North/U.S. 177 South and vice versa exist. In southeast Ponca City, U.S. 77 heads north and U.S. 177 heads south, ending the triplex of three U.S. highways. U.S. 60 enters the Osage Indian Reservation just after leaving Ponca City. This is the least exciting part of U.S. 60 in the state in terms of highway intersections and towns along the way. In a 60-mile stretch, there are just two highway intersections: OK 11/18 near Burbank and OK 99 in Pawhuska. OK 11 and OK 99 share time with U.S. 60 in the reservation. After leaving the reservation, motorists will soon enter Bartlesville, where U.S. 60 heads south for a mile and a half with U.S. 75. The next town and highway intersections are found in Nowata and U.S. 169, about 17 miles east of Bartlesville. 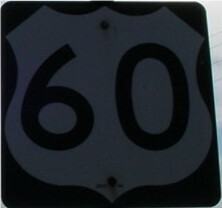 West of Vinita, U.S. 60 becomes duplexed with U.S. 69 for the beginning of a 22-mile stretch. U.S. 60 heads east at the interchange located within the interchange of Interstate 44's Exit 302. U.S. 60 traffic heads east, while U.S. 59 (which is duplexed with U.S. 60 and U.S. 69 for less than a mile at this point) and U.S. 69 North traffic continue straight ahead. Just three intersections with Oklahoma state highways (OK 125, OK 137, and OK 10) and a short duplex with OK 10 later, U.S. 60 leaves Oklahoma and enters Missouri, where it makes its way towards Springfield. U.S. 60 East/OK 58 North at OK 8 South/OK 58 North in Fairview. U.S. 60 West/U.S. 64 East/U.S. 81 South at OK 45 West. U.S. 60 East/OK 74 North at OK 74 North, east of Lamont. U.S.
U.S. 60 East/U.S. 77 North/U.S. 177 South at U.S. 77 North/U.S. seem to indicate. OK 137 is actually about 1/2 mile ahead. U.S.
"Oklahoma" sign as U.S. 60 West enters the Sooner State.